The innate immune system of mosquitoes consists of two tightly interconnected responses: the cellular and humoral defense responses. These two responses act together to protect mosquitoes against a wide variety of pathogens, including bacteria, yeast and viruses. The cellular defense response includes phagocytosis, nodulation and encapsulation of pathogens by hemocytes [20, 21]. Humoral responses refer to the activation of downstream signaling and effector responses, leading to the synthesis and secretion of soluble effector molecules, such as antimicrobial peptides (AMPs), reactive oxygen species (ROS) and components of the phenoloxidase cascade [14, 22–25]. 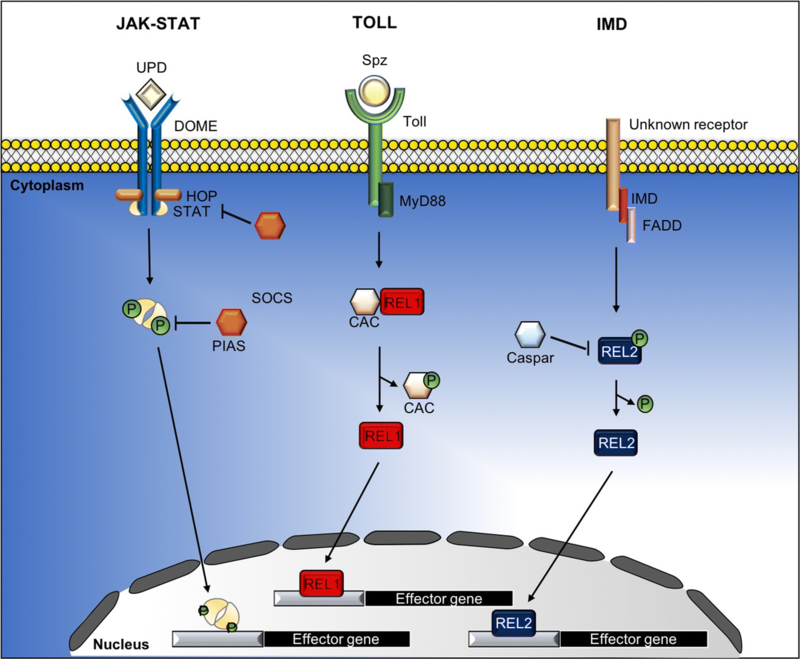 Downstream signaling and humoral effector responses will be discussed later in this review. These effector molecules are secreted into the hemolymph to control infection caused by invading pathogens [26, 27]. Epithelial cells in the mosquito midgut are the first line of defense against many pathogens which are acquired from blood-feeding and these cells can synthesize several AMPs and ROS. Additionally, the fat body of the mosquito is the primary site of the humoral response via production and secretion of AMPs. The transcription of innate immunity genes encoding for AMPs is highly dependent on several signaling cascade pathways, including the Janus kinase-signal transducer and activator of transcription (JAK-STAT), Toll and immune deficiency (Imd) pathways [9, 14, 25, 28, 29]. Although activation of these pathways has been shown to limit viral replication, the most robust antiviral defense is the RNA interference (RNAi) pathway. 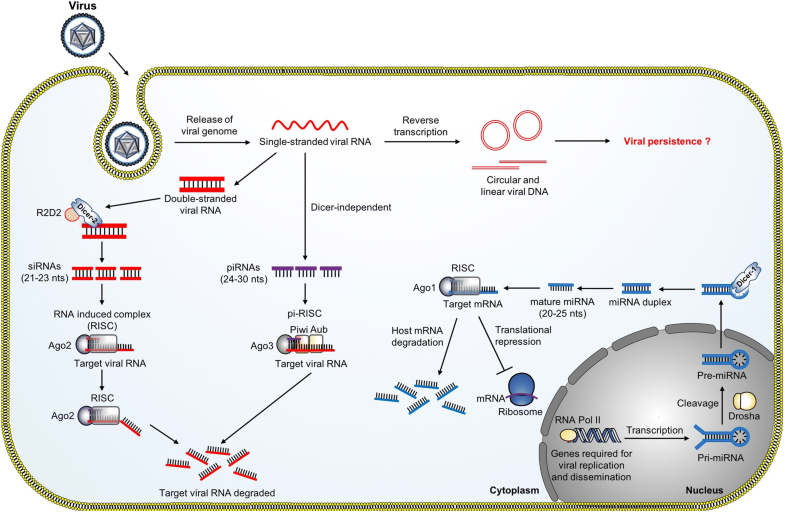 The RNAi pathway produces small RNAs using viral double-stranded RNA as a template to ultimately target the viral RNA for degradation, thereby inhibiting viral replication . Virus recognition is mediated by pattern recognition receptors (PRRs) that recognize virus-conserved pathogen-associated molecular patterns (PAMPs) to initiate innate immune responses. Besides the well-studied siRNA pathway, recent studies have highlighted the importance of the piRNA pathway in the mosquito antiviral response [51–53]. Interestingly, the piRNA pathway can mount an antiviral defense with a defective siRNA pathway, indicating the redundancy of RNAi-mediated antiviral immune responses . In contrast to siRNAs, the biogenesis of piRNAs does not require Dicer and the size distribution of piRNAs is around 24–30 nt . In Drosophila, the biogenesis of piRNAs involves three Piwi proteins, including the P-element induced wimpy testis (Piwi), Aubergine (Aub) and Argonaute 3 (Ago3), to form a piRNA-induced silencing complex (piRISC) . The biogenesis starts with the primary processing pathway, which is the synthesis of primary piRNA pool from single-stranded precursors. The primary piRNAs can be associated with the Aub and Piwi protein. Interestingly, the primary pool of piRNAs can undergo an amplifying process known as the ‘ping-pong’ cycle to further amplify the Aub-bound piRNAs to refine the piRNA pool. This amplification process serves to ensure an efficient piRNA-mediated silencing of target RNA [52–54]. The presence of virus-specific piRNAs was detected in Ae. aegypti and Ae. albopictus during CHIKV infection  and in SINV infected Aedes cells . Deep sequencing data reported the presence of SFV-derived piRNAs and silencing of PIWI 4 protein resulted in increased SFV replication and virion production, suggesting the importance of the piRNA pathway in antiviral immunity . Autophagy is an evolutionarily conserved process that sequesters and mediates the degradation of cellular components, such as proteins and organelles, to maintain cellular and tissue homeostasis . Autophagy involves the sequestration of damaged organelles or misfolded proteins by forming double-phospholipid membrane vesicles, known as autophagosomes. The autophagosomes then fuse with lysosomes to mediate the degradation of sequestered contents within the lysosome [93, 94]. In addition to the role of autophagy in maintaining cellular and tissue homeostasis, a protective role for autophagy against intracellular pathogens including viruses has been shown in mammalian systems and, to a lesser extent, in Drosophila [95–97]. In Drosophila, antiviral autophagy against vesicular stomatitis virus (VSV) and Rift Valley fever virus (RVFV) is activated through pathogen recognition by the Toll-7 transmembrane receptor. The activation of Toll-7 leads to the activation of autophagy via the phosphatidylinositol 3-kinase (PI3K)-Akt-signaling pathway, which is an autophagy pathway that senses the status of nutrient availability. Upon activation, autophagy is able to limit viral replication in flies. Furthermore, loss of Toll-7 leads to an increase in viral RNA production in Drosophila cell line  and Toll-7 mutant flies which are more susceptible to RVFV infection [95, 96], suggesting that there is a role for autophagy in controlling viral replication. Due to the conservation of autophagy, it is postulated that the autophagy pathway is also involved during viral infection of mosquitoes. For example, during DENV infection, autophagy is activated to generate energy for viral replication. In particular, autophagy regulates lipid metabolism by degradation of the lipid droplets to release lipids that undergo oxidation to generate energy for viral replication [91, 98]. However, the role of autophagy during virus infection of mosquitoes is still largely unknown.